I have to admit that I was worried about whether or not the Yankees could, again, put up strong offensive numbers against the Angels last night. 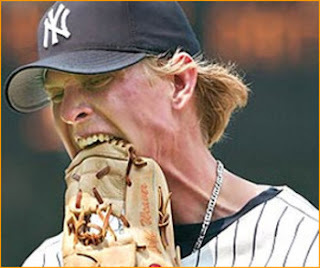 After all, Jered Weaver was on the mound for LA and he has always been tough against New York. However, the old saying, "you can't predict baseball" was perfectly demonstrated last night, as Weaver had nothing. He allowed nine runs, most of them at the hands of Alfonso Soriano, who obviously thinks he is back in his first tour of duty with the Yankees, when they were an elite team in MLB. Jered Weaver was so bad last night that he reminded me, and many others no doubt, of his brother Jeff. You remember Jeff Weaver, Yankees fans. Right? Ah, yes, the Jeff Weaver Era. Definitely not one of the better ones in Yankees history. The Jeff Weaver Era was a lot like the Phil Hughes Era, which we will get another look at today. Well, at least the Yankees will get him out of the way before they head to Boston for this weekend's series against the Red Sox. Thank you, baseball gods, for that. But, then again, you can't predict baseball. Perhaps Hughes will surprise today. I'm not holding my breath, though. I caught the tail end of the game last night. So, it was Jeff Weaver's brother who got rocked? Wow. Can I just say how happy I am to get Soriano back? I was actually listening to the game. Sometimes silence is professional. Especially in a case like this. I commend John and Suzyn for the way they announced a very difficult game.